1. General : 1. The purpose of the Bomb, Ground, 6-Lb. is to enable liquid contamination with persistent gas to be put down in trenches, dug-outs, rooms, observation posts and small enclosures, and on cross-roads, narrow defiles, obstacles and debris of demolition. Its use on larger areas such as woods, belts of demolition and river crossings is possible, but would be uneconomical both in men and material. The chemical mine and the bulk contamination vehicle are more suitable to such tasks. 2. Direct contamination will be used chiefly in defence before contact with the enemy; and in withdrawal, in order to impose delay, and to render the occupation and traversing of, or work in, areas of the type mentioned in para 1. above, impossible except at the risk of casualties. It will be of great assistance in increasing the effectiveness of obstacles and demolitions. 3. The chief characteristics of the bomb are:--i.It is small and easily transportable. ii.It is safe to handle. iii.It necessitates very little training. iv.It enables contamination to be put down exactly where it is wanted. 2. Description : 4. The bomb consists of a cylindrical steel container, painted grey, varnished internally, 3-3/4in. in diameter, 9in. high, weighing 6-Lb. (see Plate 1). It holds 3½Lb. (about 2 pints) of mustard gas. Bombs will be issued, complete with ejection charges, in boxes of ten weighing 75Lb. 5. The bomb is fitted with a metal lid 2in. deep which is a good push fit on the body. This lid is fastened to the body by adhesive tape. In the centre of the underside of the lid is a striker for use on the match composition head of the ejection charge. 6. At one end of the bomb is a screwed plug. This is the filling plug. In order that any leakage may be readily detected the plug is coated with detector paint. 7. When the lid is removed the ejection charge will be seen. It consists of about 1/7 oz. of gunpowder connected by 32 in. of safety fuze to the match composition head. This length of fuze gives a delay of two minutes. The safety fuze is coiled in concentric circles in a shallow metal saucer and is set in bakelite cement. 8. The ejection charge has therefore the appearance of a circular plate 3½ in. in diameter. On the lower side is a threaded boss closed by a tin plate disc. This boss screwes into the bomb, the gunpowder charge being just above the tin plate disc. On the upper side of the ejection charge in the centre there is a flatened projection used for screwing the ejection charge into the bomb. The charge is also housed in the projection. On the rim there is another smaller projection holding the match composition head. The ejection charge is designed to blow out the end of the bomb fitted with the filling plug. 3. Care and maintenance : 9. Careful handling, storage in a cool and dry place, and periodical inspection, will ensure that the bombs remain in good condition. Rough handling must be avoided. Weak points are the filling plug and the match composition head. Any loosening of the filling plug will result in leakage of liquid. Damage to the match composition head will make it difficult or even impossible to ignite the bomb. 10. Storage conditions should comply with Magazine Regulations. Temperatures below the freezing point of the blister gas will not affect the functioning of the bomb, but contamination by the frozen gas is liable to be erratic, and will in any case be largely ineffective until the gas has melted, due to rise in temperature. 11. Bombs should be inspected for leakage on reciept, monthly, and after any move. In addition to the filling plug, another possible source of leakage is the welded joints of the bomb body. 4. Method of firing : 12. Remove the lid and place the bomb on its side on the ground with its plugged end down wind. In the centre of the lid will be found a paper wrapped striker. Remove the paper and, with the striker, rub smartly the match composition head of the ejection charge. 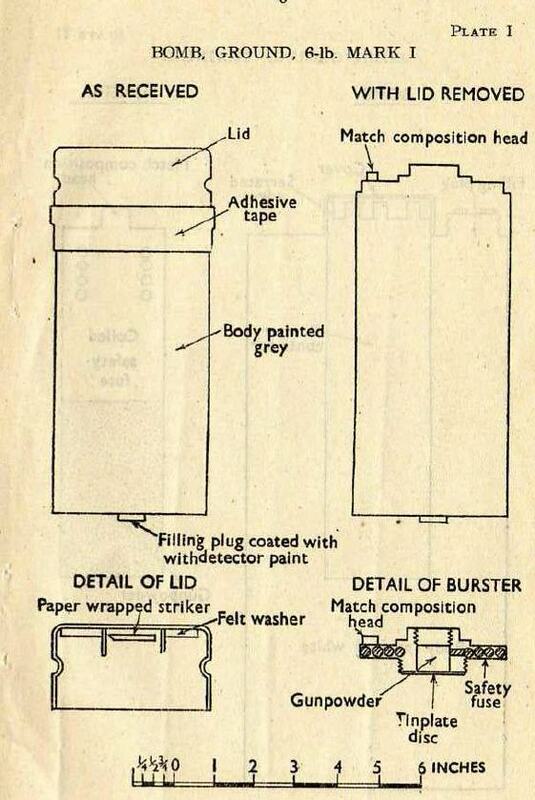 This match composition head will light the safety fuze which after a delay of two minutes will ignite the gunpowder. If the striker for any reasons becomes unserviceable the match composition head can be lit either with an ordinary match or fuzee. 13. When it is necessary to fire several bombs at a time, all bombs should be laid in position before firing commences. The distance and intervals between bombs will depend on the extend to which it is necessary to produce a continuous contamination, and on the strength and direction of the wind. One bomb will heavily contaminate an area of about ten square yards, the majority of the pattern being down wind. A larger area will be covered with lighter contamination, the size depending on the speed of the wind. 14. When the bomb bursts, its plugged end, and possibly other fragments of metal, may fly to a distance of 25 yards. Blister gas, in drop form, or even in the form of a fine mist, will travel considerable distances, especially in a stong wind. All personnel should therefore be 100 yards clear in an up-wind direction or to a flank, or 300 yards clear in a down-wind direction, within two minutes of the time of lighting the first bomb. When retiring down wind, respirators must be worn. Where a number of bombs is to be fired simultaneously, sufficient men should be available to carry out the task within the above time limit. The use of protective clothing or suitable cover would enable the distances to be reduced. 15. Contamination, once laid, will immediately produce a vapour concentration down wind. The degree of vapour concentration will depend upon a number of factors, principally the temperature, the speed of the wind, and the type of gas used. No hard-and-fast rule can be given, but as a guide, no contamination should be put down within 150 yards of any position likely to be occupied by our own troops for a prolonged period.